The US is behind the attempted coup in Venezuela – that is the accusation President Nicolas Maduro has leveled amid widespread protests back home. And it’s none other than Vice-president Joe Biden who’s behind the entire operation, Maduro alleges. 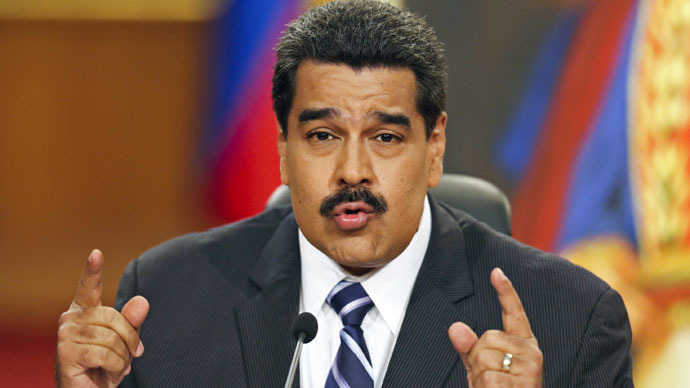 This is the first time a direct accusation of this gravity was made in front of thousands of cheering spectators and the world at large, despite an earlier Friday statement, when Maduro struck out at several US federal agencies for allegedly plotting against Venezuela. "The northern imperial power has entered a dangerous phase of desperation, going to talk to the continent's governments to announce the overthrow of my government. And I accuse Vice-president Joe Biden of this," the head of state said, addressing the people at the 198th anniversary of the birth of a Venezuelan hero general Zamora in Cua, Miranda state. “There are US diplomats in Venezuela contracting military officials to betray their country, looking to influence socialist political leaders, public opinion leaders and entrepreneurs to provoke a coup,” the head of state went on. The President addressed the nation on Sunday in order to strengthen its resolve in times of what he called “a bloody coup”, as demonstrators flooded the streets demanding his resignation amid an economic crisis that is hitting the food sector first, just as the voices of thousands of others could be heard cheering him on, as they smiled and waved flags. “The people must be prepared to rescue their democracy, the Constitution and their revolution” at times like these, the head of state warned. Only a few days prior to the occasion, the leader had appealed to his fellow countrymen to burn their US visas to send a message to the “imperialist Yankees”, but the accusations of a coup had before only dealt with members of the political opposition at home and their being influenced by other unfriendlies in the region. But as the price of oil – which accounts for 95 percent of its export earnings – begins to plunge, so do Maduro’s public ratings, which are now at little more than 20 percent, according to local media. With the situation changing, Maduro said that it’s difficult to imagine, despite earlier promises, how to maintain diplomatic relations with the US, in light of its constant attempts to subvert the Venezuelan leadership and sink the country into a crisis. Washington and Caracas have been at odds regularly after iconic former leader Hugo Chavez had come to power in 2000. The US had already been accused of trying to undermine the Venezuelan government in 2002, when a coup saw Chavez ousted from office for 47 hours, before order was restored.